I am happy to announce my new release – Teaching Philip – Book 8 from my Tarnished Saints Series. Philip Taylor is the principal of Sweet Water High, that is, until Taylor Phillips blows into town not only stealing his job but also his name. And just like their names, these two are total opposites. Philip is obsessed with cleanliness, organization and getting places on time. Taylor, on the other hand, is too laid back. Her apartment and office are cluttered and disorganized and she likes to kick back with a beer and watch football with Philip’s brothers on the big screen TV in the Man Cave. Little do these two know they’ve actually been dating each other online anonymously and getting along great. But the secret is about to explode in their faces and change their lives in more ways than one. Yes, these two are truly an Odd Couple. For a very limited time you can get a copy of Teaching Philip for only 99 cents. The price will be going up to $2.99 soon, so get your copy quickly. As an extra bonus to celebrate the series, You can also pick up a copy of the series prequel – Tarnished Saints’ Christmas for FREE until 6/7 only. And take the opportunity of catching up on Books 1-7 too, as for one week only they are ALL priced at only 99 cents. (Regular price $2.99) These books are exclusive to Amazon, and if you are a Prime member or belong to their Kindle Unlimited Book Club, you can borrow these books and read them for free! I am also having a contest. By entering thru rafflecopter below, you can win an ebook copy of Saving Simon – Book 5 of my Tarnished Saints Series or one of my medievals, Ruby – Book 1 of my Daughters of the Dagger Series. 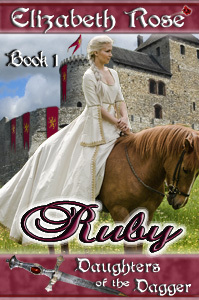 Watch for a new medieval series as well as a new western novella coming this summer! And don’t forget about my limited time offers on my boxed sets. Only 99 cents for my Ancient Warriors and Lovers, Border Lords and Ladies, and Dragon Lords and Warriors boxed sets. The price on these sets will not last long, so pick up your copies today. Click the links to see what books are included in these sets. And don’t forget, if you enjoy my books, I’d love for you to leave a review on Amazon for me. This entry was posted in Contemporary Romance, contest, Free book, Medieval Romance, New release, Uncategorized and tagged Book contests and giveaways, Elizabeth Rose free book, new release romance by Lizrosek. Bookmark the permalink. I think musicians make for great characters. I was close friends with a symphony conductor and he was a most interesting man.Of course there can be very heroic men in every profession. Maybe because I married one, I am partial to Marines! I’d really like to read Ruby. How about an Emergency Room doctor? That would present both funny and dramatic situations that would be entertaining to read. There is so many to choose from but I like Sheriff’s & Cowboy’s. Geraldine, I do too. Thanks for stopping by. I think that it is the man that makes the profession interesting. I think for pure novelty, the dog sled trainer is a very interesting hero. When it comes down to it, I don’t really care what profession a hero has… it is everything else about him that makes him attractive to me. The profession is just one part of it… it is his personality and how he acts towards people and the heroine that make a hero interesting to me. I would choose a sheriff as an interesting occupation especially in a town rather than a city. A man isn’t defined by his occupation but who he is and how he chooses to live his life. I like any of the military men or firemen, cop or even an Doctor. I like firemen, but I would love to see one with a soldier!